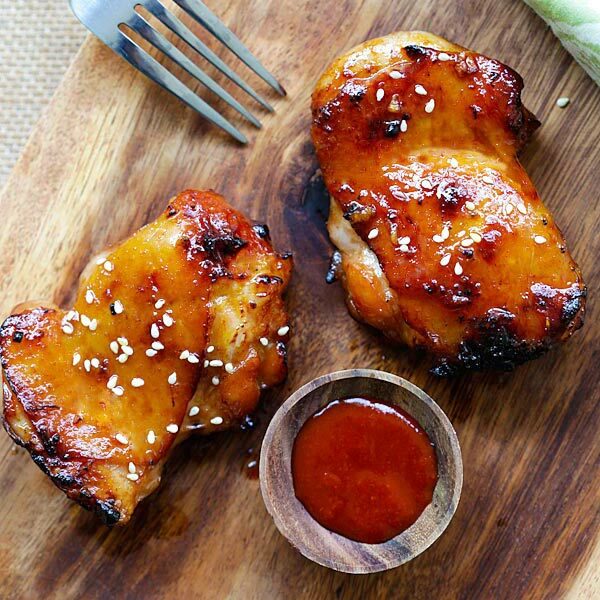 Honey Sriracha Chicken – crazy delicious chicken with honey sriracha marinade. 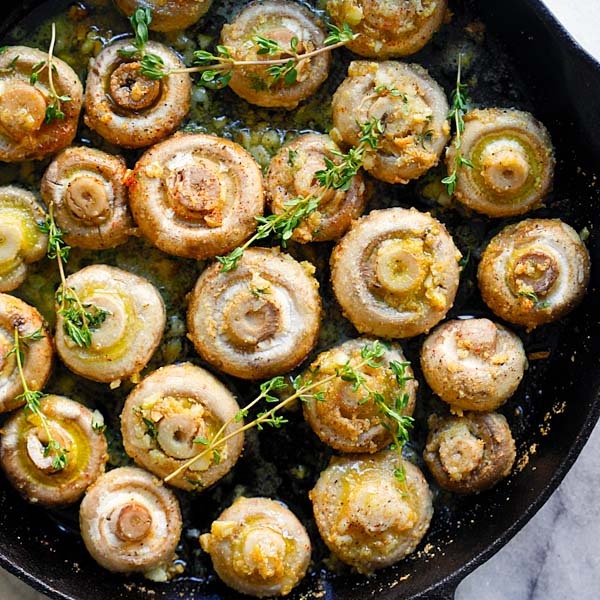 Make it on a skillet, bake or grill for dinner tonight. When it comes to making delicious Asian recipes, it’s all about the perfect balance of flavors: sweet, spicy, salty and sour. Not all components need to present in a dish, but when it does, you’ve got the most amazing tasting food ever. 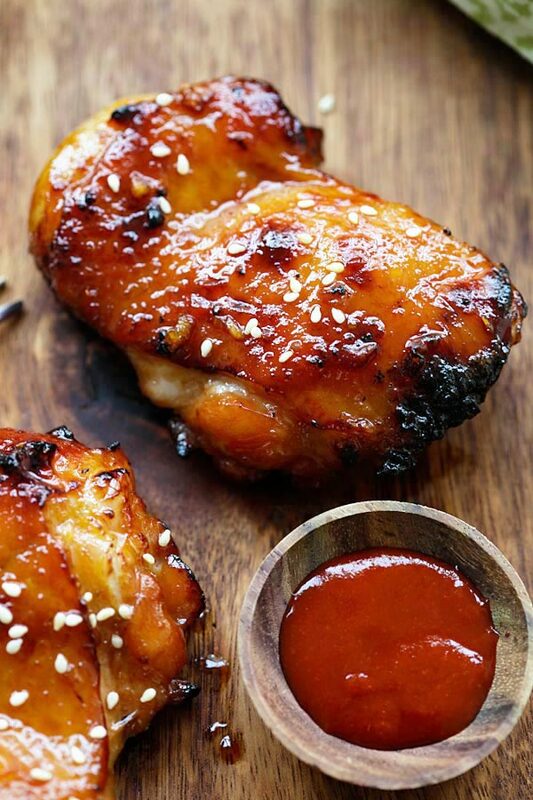 This honey sriracha chicken fits the perfect bill. It’s sticky sweet, spicy, salty, with a tint of sour. The chicken is extremely moist, juicy, delicious, bursting with bold flavors and absolutely addictive. I found myself scraping off the sticky sauce on my skillet after I finished all the chicken. Just look at the pictures, you can’t blame me for doing that! The best thing of all is the simplicity of the recipe. It takes 6 ingredients, nothing out of the ordinary. 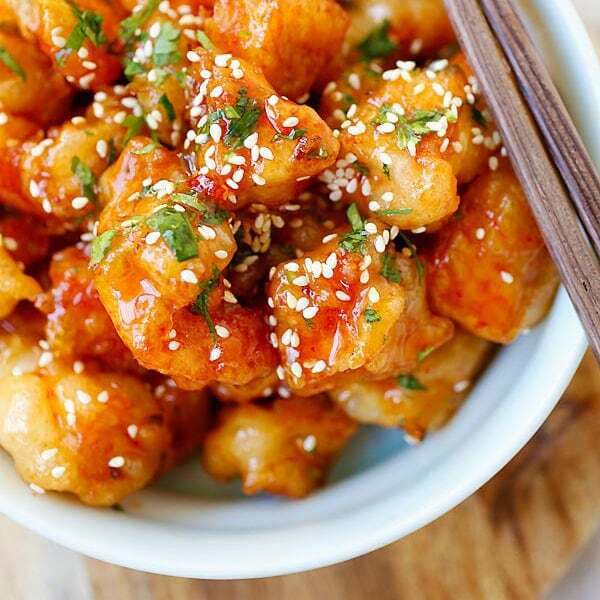 Chicken, honey, Sriracha, vinegar, garlic, and salt, which you already have in your fridge or pantry. For the chicken, you can use chicken breast, thighs, drumsticks or wings. 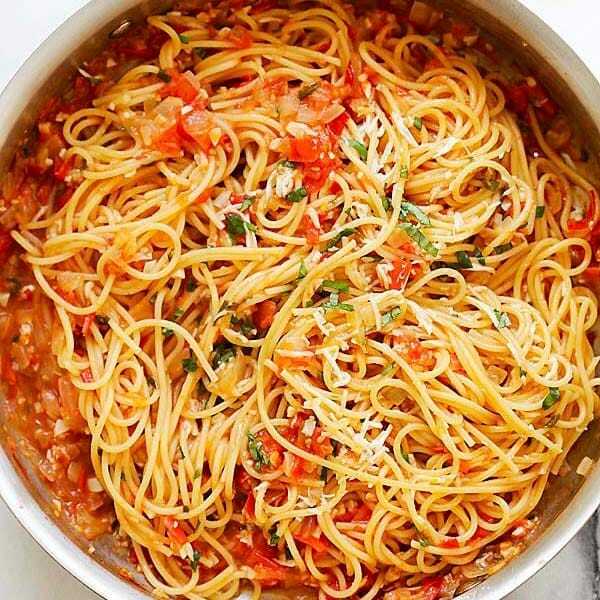 Make it for dinner tonight! 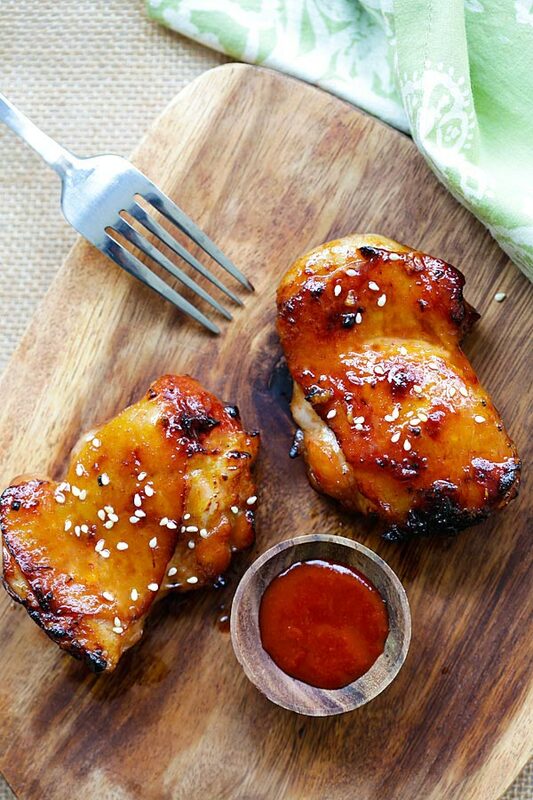 Whisk the Honey Sriracha Marinate together. Mix well. Add the garlic and Marinade to the chicken, stir to combine well, marinade for 30 minutes. Heat up a skillet (cast-iron preferred) on medium heat. Add the oil. Transfer the chicken to the skillet and cook on both sides, until they turn golden brown and cooked. Add the remaining Marinade to the skillet, as soon as it thickens, turn off the heat, top with some sesame seeds (if using) and serve the chicken immediately. All photos and recipes on Rasa Malaysia are copyright protected. Please do not use the photos and recipes without prior written permission. If you wish to republish this recipe, please rewrite the recipe in your own words instead of copy and paste and link back to //rasamalaysia.com/honey-sriracha-chicken/. Thank you very much! Cook on medium heat and also keep flipping over. Sriracha sauce is most certainly available in Oz. Look in Asian grocers or even Woolworths. This was GREAT! I used boneless skinless chicken breasts and they are awesome! I can’t remember how to clean my cast iron skillet but it was worth dirtying it up! 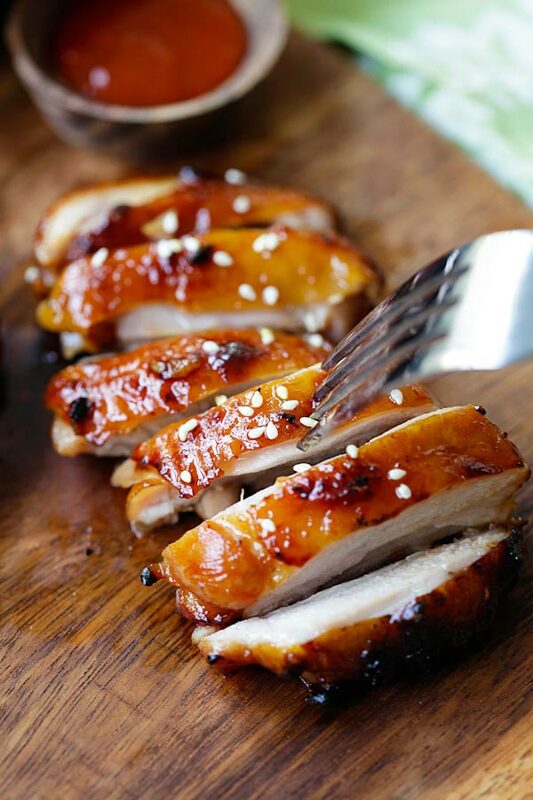 I have made a similar version of this – honey balsamic – I prefer the honey sriracha!!! Very great recipe, thanks! I just use kosher salt to scrub any stuck on particles. I rinse with just a little hot water, wipe down excess moisture, then put it on the stove medium high heat until dry. It’s a good idea to rub a little oil on your pan once it’s clean. It’s sounds like a lot, but it might take 5 minutes if that. Worth it to keep it in great condition! Thanks for your tip Vicki! Denise, try to soak in warm water and then clean cast iron with a salt scrub to remove stuck on bits of food. It’s easy and safe for the iron. Made this tonight & cooked chicken thighs in oven on a rack. So easy, chicken moist & tender. Served with steamed rice, pickled daikon & carrot & also some Kewpie Mayo. So yummy. Love Rasa Malaysia website! Wow sounds very yummy!! I love the idea of Kewpie Mayo! If making chicken wings ( I will be using breaded chicken wings then tossing the wings in the sauce) would I need to cook the marinade at all or just make it as done in your recipe and toss as is? Really looking forward to trying this! You don’t have to cook the sauce just toss. Fantastic! So easy and very delicious. That sticky sauce is really good on rice! Yes correct. I love the sauce! Hi! Made this today and the chicken’s skin had a great taste, but the meat was quite bland. Any ideas to make the meat absorb the sauce? I marinated the chicken for 1.5 hours in the fridge. Thank you! Marinate it longer or overnight. Hi, Bee. These look soooo good. 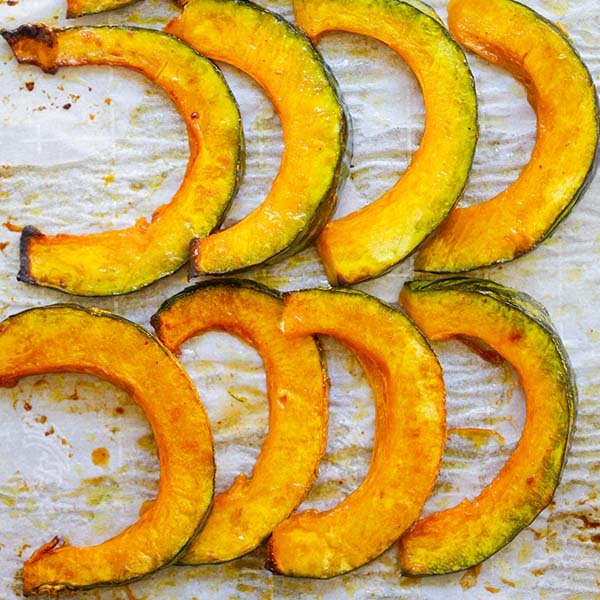 Am trying them in the oven tomorrow. But could i use bone-in thighs instead? Not sure if there will be any meat left if i attempt to debone them myself. In the meantime, have a Happy & prosperous year of the Monkey! Yes you can use bone-in chicken thighs, just marinate longer. If I use boneless skinless chicken breasts that are not very thin would you recommend baking or in a pan (not cast iron)? Which will get the best glaze and juiciness? Thanks! Baking is probably better to retain the moist. love it with cucumbers cold plain and peeled and spicy Thai rice. Crazy good. I made this tonight using boneless skinless chicken thighs and it was absolutely delicious! It is one of my favorites now. Thanks for the great recipe! If baking, do I flip halfway through? And do I bake covered, or uncovered? Thank you! Uncovered. No need to flip if baking. Thanks Mike so glad that you liked my honey sriracha chicken recipe. Try more recipes on my site they are all easy and delicious. Hi Jolene, thanks for your sweet comment. 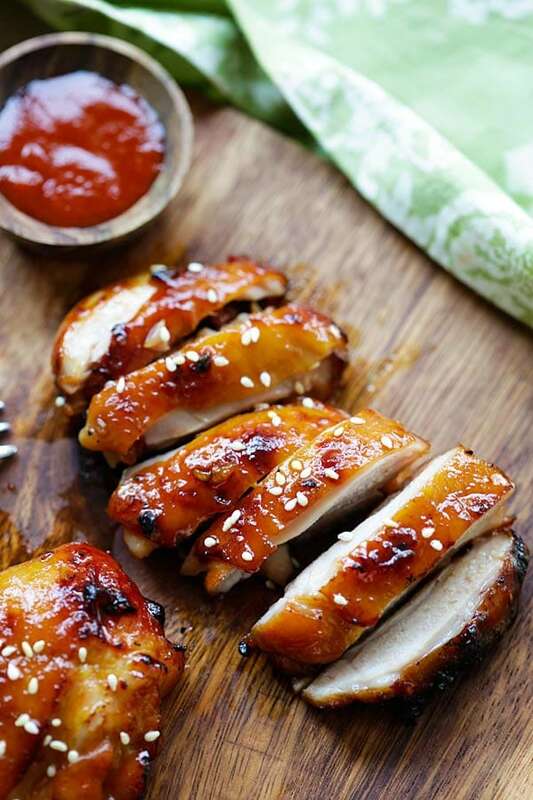 I am so glad that you like my honey sriracha chicken recipe. Try more recipes on my site they are all easy and delicious! Hi Joshua, thanks for trying out my recipe and I am so glad you scored a very high point from your wife. 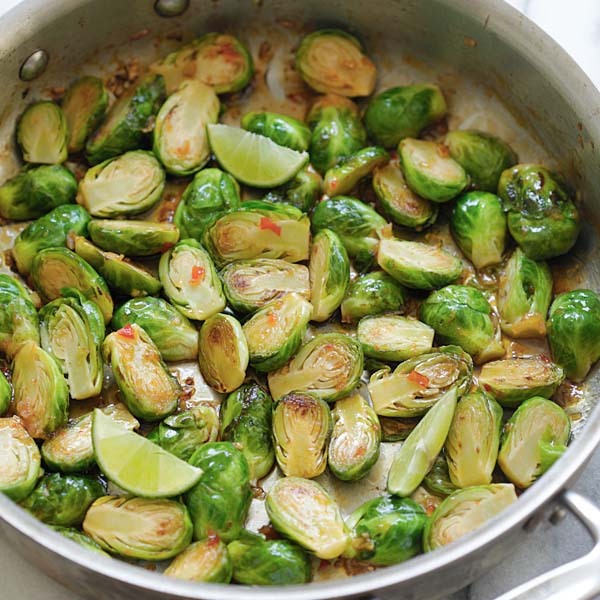 Do try all other easy and delicious recipes on my site! I made this today, its so good! I baked it and it turned out perfect! If i wanna cook 8-12 thighs at the same time, do i double the cooking time? Or the same 20 minutes? Hello, what would be the best type of chicken to use for this recipe to get the best taste? I was gonna try legs and thighs skin on would that work or not? Thank you cant wait to try..
Hi Becky, yes, thighs boneless but skin on like I stated in my recipe. Hello! Made these for lunch today served with tomato rice and they are delicious! Absolutely yummy , love the combination of honey soy vinegar and the mild spicy tang of the sriracha :) Thanks for this great recipe! Will be looking forward to making more dishes from your site. This was my first time trying out your recipes and the results are so good ! Rasa Malaysia, Easy Asia Takeout, E-book is a must have for $4.99 it’s a steel, one download on mac and one download on iphone, it is so nice to have this on my phone. 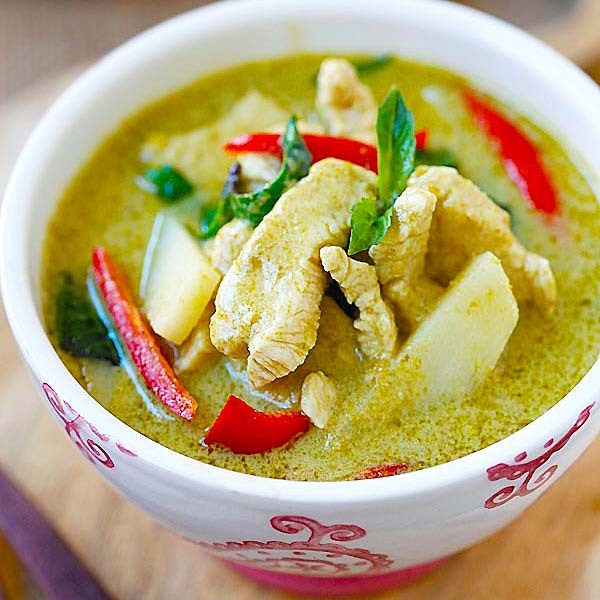 I love Asia food and have made 6 for this E-book. I made this for my son who is a picky eater, especially when it’s chicken. I must say it was quick and easy and he enjoyed it immensely. This will be placed in my arsenal of recipes to be used again. Also if I may, I find your recipes quite easy to follow and the ingredients easily available. I love all of your recipes. Thank you for what you’re doing. Hi there! Two things: 1) This recipe sounds amazing and I can’t wait to try it! 2) You may want to check out this webpage’s script, especially the one it goes to after you click the “click here for recipe” link. Everything is fine for the first few minutes, but then suddenly you can hear an ad playing in the background that doesn’t sync up with any of the actual ads on the page. This happened several times when I was trying to look at this recipe, and the webpage would eventually seize up and I had to force quit. I know this isn’t something wrong with my laptop, as this is the only page I’ve had this happen on. You may have something imbedded that you don’t know about. Hi Aly, can you tell me the device you were using? My laptop, using Google Chrome. can I use balsamic vinegar instead? We were thinking about grilling these tonight. I’m concerned about there being a lot of flare ups because of the honey in the marinade….do you have any suggestions? Just bake with the sauce together with the chicken. Gunna try this, my family loves your Peking Pork Chops recipe I’m sure they will love this one as well! Thanks for the great site! Thanks Darrly, yes this recipe is delicious! I followed this directly (only merinated 20min) & put in oven Recc time & when it came out of oven all sauce evaporated :[ and it was tasteless.. what did I do wrong :(( sauce was not sticky or thick like the picture :( help! Hi Cheri, I am sorry you had problems with the honey sriracha chicken recipe. Many readers had tried it with great success. Which part of chicken did you use? If you are baking, cover it with a foil if the sauce evaporated. Usually, after baking, the chicken would have the juice seeping out, making it even more saucier. Broil for just a little bit so you get the slightly charred surface. Tried it yesterday and it was delicious. I only have a concern, because I heard that honey shouldn’t be put in boiling water (tea, for example) because in high temperatures it not only loses it’s nutritional values but becomes harmful for health. So I am concerned if cooking the sauce is a good idea at all? Hi Arson, I am not sure about that, I will have to do some research. Made this tonight and it was great. Thanks for the recipe. Thank you for this recipe. Twice I referred to Rasa Malaysia for a recipe the other one was laksa and they did not fail. Tastes really good. For this one I baked the chicken 20mins closed foil then 20mins open to give it some browning. I wish I could show you the picture. Will be doing this over and over again. And it’s guilt free! Thank you! Hi Renen, thanks so much for your comment. I am so happy that you enjoyed my honey sriracha chicken. Try more recipes on my site. They are all good! Thanks for the recipe. It was delicious!!! Thanks Eve for trying my honey sriracha chicken. Dang! Just marinated thighs with this recipe and then scrolled down to see only breasts, wings or drumsticks. Will I have problems cooking the thighs this evening? Forgot to buy chili sauce…so I used orange sauce….let’s see how it turns out!….. I baked this chicken and it was so incredible. It forms a really lovely crust and the chicken is so succulent inside. Thanks for the great recipe! any reason to “serve immediatly” would it be good to rehear if i make a bunch of it ? Yes you can reheat if you make a bunch, no problem. I love your recipes, but I am having trouble saving them. 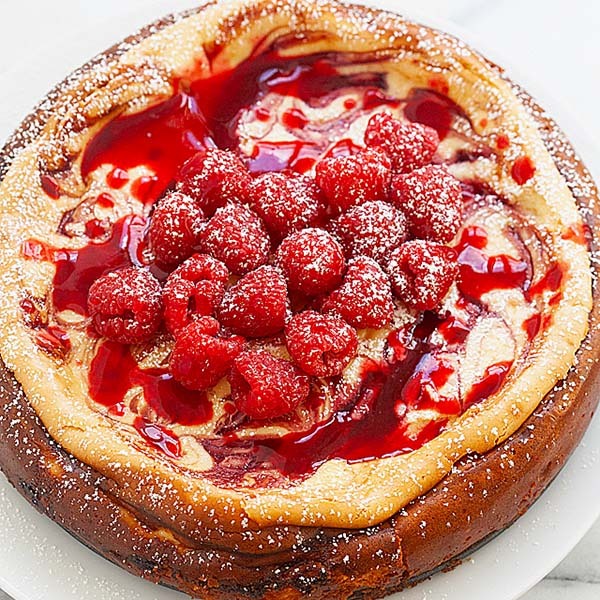 Is there a way you could add Pinterest icon to you recipes? This would make my life so much easier. I don’t always want to print every recipe, but just save it to my phone or computer in Pinterest. Thank you. Hi Terry, Pinterest icon is working on the images. Just hover it over and there is a red P button on the image, and you can pin the images. Hi Desola, so glad that you used my recipe. I am happy for you. Thanks! Hi, I am going to cook this tonight for some friends. My only question I have is, if I am baking, do I need to put tin foil on the pan when cooking or just directly on the pan?! Hi, I am going to cook this tonight for some friends. My only question I have is, if I am baking, do I need to put tin foil on the pan when cooking or just directly on the pan?!? It’s best to line with parchment paper. If not, line with aluminum foil and spray with some cooking spray. Looks awesome! How much chicken is considered in “1/2 the recipe” for the nutrition? If you choose to grill the chicken, do you just make the sauce on the side and then combine? You can marinate, you can double the sauce. If I am grilling the chicken do I need to do anything different to the sauce? Do the measurements change? Thanks. This looks really good and I will be making it tonight. Rasa this is the Best chicken ever, in my opinion. Just did wings, cooked 400 for 25 minutes, had juice running down my arm yumm! I made this and it is to date the very best chicken I’ve ever had! What an easy and incredible recipe! I used chicken breast’s and seared the chicken on two sides, poured marinade over them, then sesame seeds, them finished off in a 350 degree oven for 10 mins. I let it rest, sliced thin then mixed it around in the skillet with the sauce, imbelievably delicious! I only used two chicken breasts with the prescribed sauce and it was perfect. Thank you so so much for this treasure! Hi, Trying this tonight. My sauce is dark brown not light read. Do you have a separate dipping sauce in the pictures? I was hoping for more heat from the sriracha sauce..we love it in our house. I may bump up to a tablespoon..any feedback? I used chicken breasts, and a cast iron skillet. It turned brown, but yummy brown bits of glaze. I’ll make again, but add more sriracha. Thanks!! Sure you can add more Sriracha as you wish!